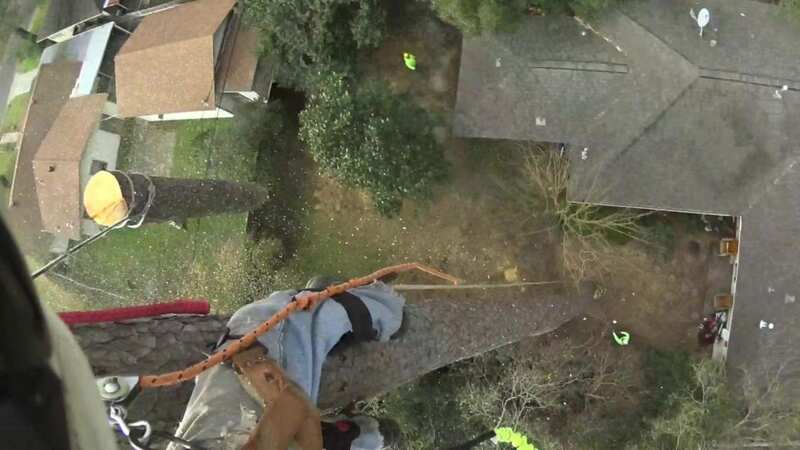 Tree removal done safely requires specialized equipment, years of training in advanced rigging techniques, a well coordinated team and lots of insurance to protect everyone involved. While we’d rather help you keep your trees healthy and thriving, we understand that sometimes tree removal is necessary. Hazardous Trees: The location of a tree is arguably the most important factor in determining how hazardous the tree is. A certified arborist can assess the risk a hazardous tree poses. Tree Health: Tree health concerns include the trees life expectancy as well as disease and decay. Branch failure due to tree maturity may be cause for removal. A dead or dying tree needs to be removed. Over Crowding: When trees are planted too close together, or in too small of a space, they are unable to thrive. Removing one allows the other full access to available resources. Messy Trees: Flowers, fruit, nuts, seeds, and pollen can all cause messes. At times they can be a big enough issue to cause for removal. 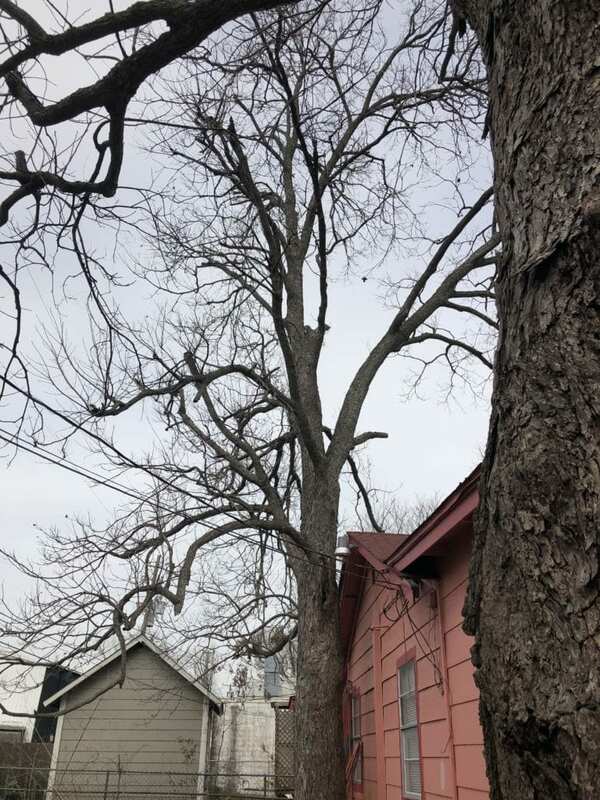 Tree Location Concerns: Trees along fence lines, in close proximity to structures, and under power lines can all be considered poor locations. Trees in the way of new construction, and trees causing damage to property would need to be removed due to location concerns. If any of these situations are occurring with the trees on your property, removal may be the answer. Hiring skilled and safety-minded professionals is key to removing your tree properly and safely. Make sure the company you hire is insured and bonded for your protection. Read more about reasons to remove a tree here -> Reasons to Remove a Tree. Additional items included in the estimate. To learn more about the cost of tree removal see our page: How much does tree removal cost? 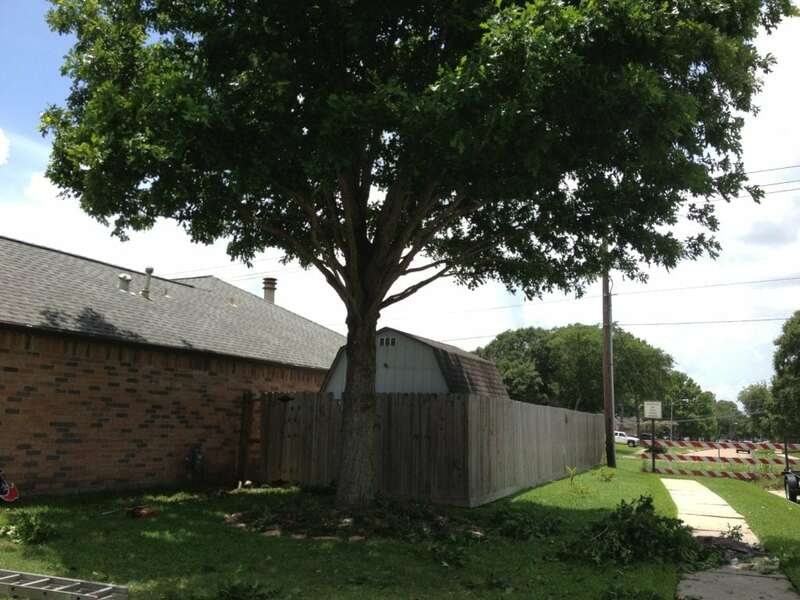 Many factors should be considered prior to hiring a company for tree removal. Protection of your property: You need to be provided with proof of insurance policies that provide specific coverage for tree removal services. 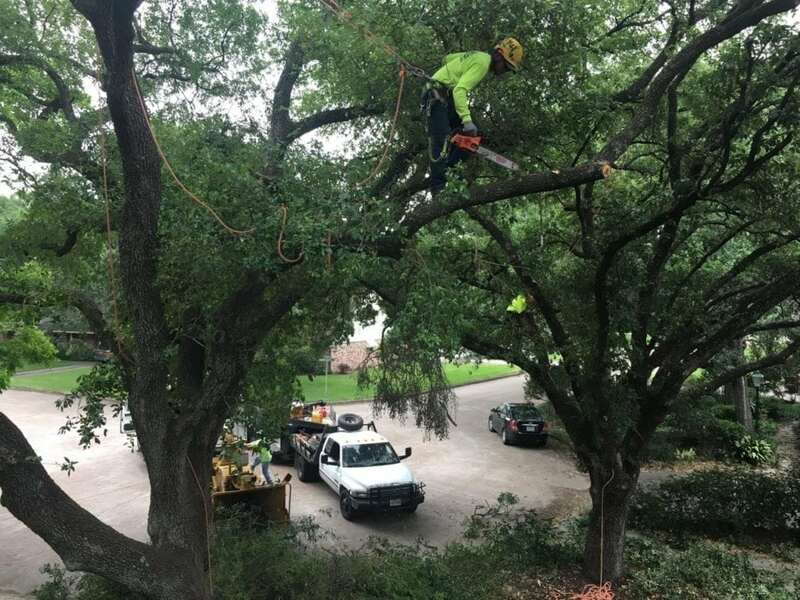 This is something that many tree services in Houston cannot offer. 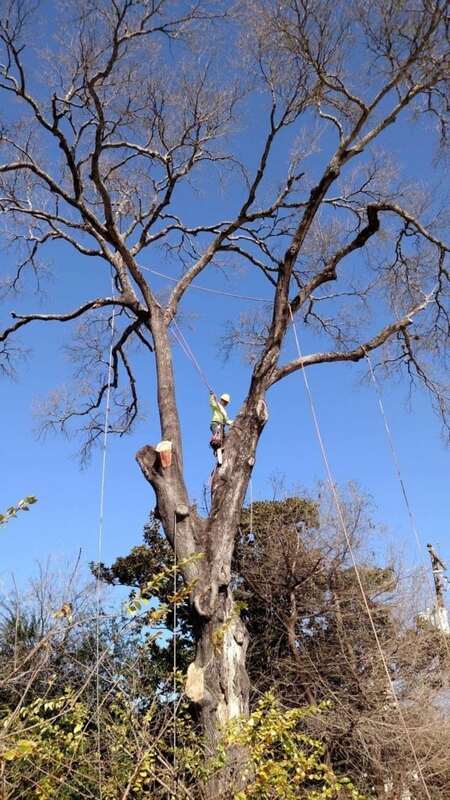 Training: A certified arborist should evaluate a tree before resorting to removal. 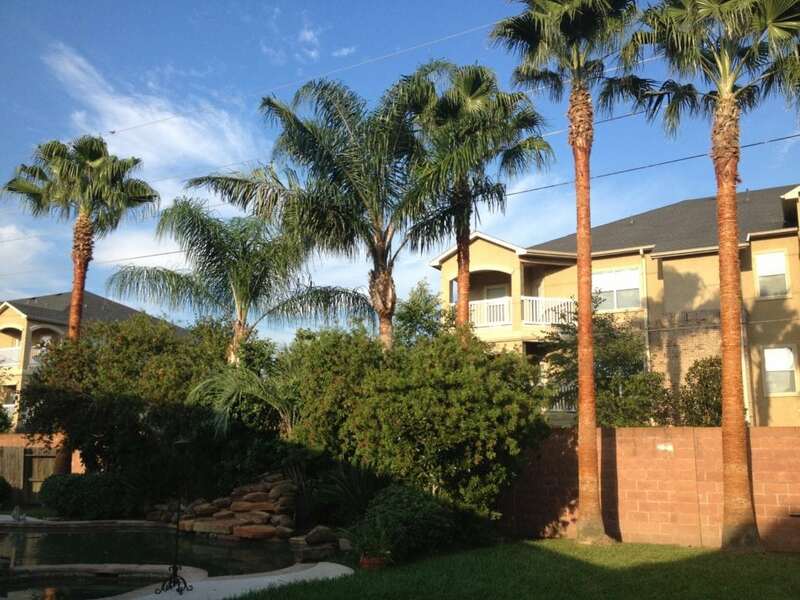 In some cases trees that show signs of stress can be saved and do not always require removal. In a short consultation an arborist can help you determine if your tree requires removal and provide you with an estimate if needed. The company you hire to remove a tree should be highly trained in the most recent ANSI Z133 safety standards for tree care operations. 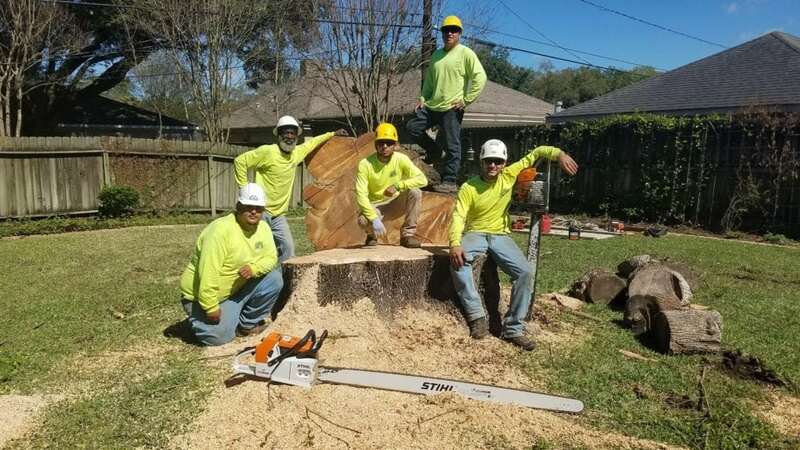 One of our tree removal teams after completing a large hazardous tree removal in Houston Memorial Area. Clean up: Not all companies include debris haul off and clean up. These factors ought to be discussed and understood before tree removal begins. After a tree is removed, you are also left with a stump. Stump Removal is another service factor that needs to be discussed and decided in the beginning of the process. Lastly, stump grinder shavings are something to consider. Want to know more about tree removal considerations? Click Below. There are several different tree removal methods. One method may be best for a tree over houses, while another is best suited for a tree in an open field. Factors such as available space to lower debris, surrounding structures and objects, and the tree’s current health and size are all considered when determining which method to utilize. Rigging is the use of ropes and other equipment to take down trees or remove limbs. This technique often allows for removal of larger limbs in less time and with more control. Trees can be felled using wedges or a tag line for added control. Tree removal methods all require careful calculations, however tree felling is the most dynamic.